The WinkBed is a very tall mattress (we measured 16") which is not common among online mattresses. It has a luxury look and feel, but how did it perform in our tests? The WinkBed Plus is a variation on the company's flagship model intended for heavier individuals, or those looking for a super durable mattress. The WinkBed is a luxury hybrid mattress that combines the plush comfort of a foam bed with the contouring support of an innerspring. We think it's the best of both worlds. Each one of our beds is built in the U.S.A. using only the finest quality, American-sourced materials. During third-party tests simulating a year of normal bed usage, there was less than a 1% change in the height and support of the sleep surface. This blows away nearly every other mattress you'll see in stores or online. WinkBed mattresses are backed by a 10-year, non-prorated warranty against any and all manufacturing defects, and a 101-night in-home trial. 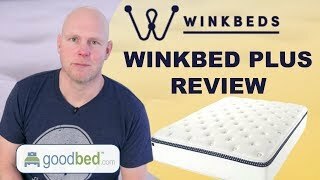 To decide whether WinkBed is the right choice for you, read GoodBed's expert review of the WinkBed mattress or watch our in-depth video review of the WinkBed mattress. We have also separately reviewed the WinkBed Plus, the variant of this mattress intended for persons weighing more than 300 pounds. See our expert review of the WinkBed Plus, or watch our WinkBed Plus video review. Is WinkBeds the right bed for you? 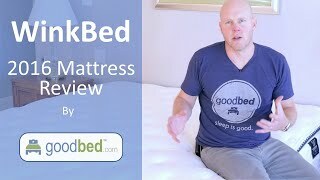 WinkBeds mattresses are recommended by 49% of owners on GoodBed (based on 92 ratings + 8 reviews). Do you have something to say about your WinkBeds mattress? Write a Review! Foam Details: Optimized for pressure relief, this supple material cradles your body without leaving unwanted "body impressions" when you roll over. Micro-Coil Details: 2.5' high, 1,722 individually wrapped coils (in a king). Second Layer Details: 1" STABILIZING GEL FOAM sits just below the top layer. Absorbs most motion transfer and contours to your body—even with a restless partner. It also evenly distributes weight and directs heat away from the body. Third Layer Details: 2.5' high, 1,722 individually wrapped coils (in a king). Top Layer Details: 1" HYPER-SOFT™ FOAM. Optimized for pressure relief, this supple material cradles the body without leaving unwanted "body impressions" when you roll over. It's more buoyant than memory foam and softer than latex. Edge Support Details: 4.5" wide, 65-ILD foam with a 1.5-lb density. Pocketed Coils Details: Soft on touch, firm on deep compression, our tempered steel coil base provides localized pressure point relief and push-back body support for optimal alignment of your spine and joints. Support Layer Details: 1,054 pocketed coils (in a king). Note: The product line specifications above were derived from the active WinkBeds models listed on GoodBed. As a result, these details may not be comprehensive and may not apply to all WinkBeds models. If you are seeking specifications for a particular WinkBeds mattress, please search for that mattress by name on GoodBed, or check with your local WinkBeds dealer. Which mattress from WinkBeds is best for you? Before shopping at WinkBeds, take a short quiz to find which of their mattresses best matches your unique needs and preferences. Powered by GoodBed’s intelligent matching technology, you can even get your personal match score for each of WinkBeds's available mattresses, in addition to other online options that match your criteria. Sleep Better Sleep. Live Better Life. WinkBeds is a mattress manufacturer founded in 2015 that is based in New York, NY. Have an update or correction to our information about WinkBeds? If so, please take a moment to suggest an edit. WinkBeds mattresses sold by WinkBeds come with a 120-night in-home trial. 101-night trial period with free returns, including in-home pickup by WinkBeds. You can also exchange for a firmer or softer option ($49 fee). 30-night min trial period. No return fees. Exchange fee of $49 covers re-delivery and pickup of old mattress. WinkBeds mattresses are only available online.